1987 Topps Ivan Drago - In 1987, Topps paid tribute to the greatest boxing villain of all time by releasing a special edition card found one in every 36 packs. Drago, now retired after his defeat at the hands of Rocky Balboa (who single-handedly crushed communism in the process), was set to sign a limited run of of the cards, but plans were scuttled after protests from Apollo Creed's estate. 1977 Topps Gay Darth Vader - Not as popular with their young male audience as Topps hoped, the card nevertheless marked a seminal moment in the company's history as it was the first all glossy release of a regular series card. 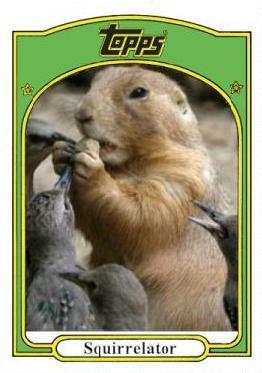 1972 Topps Squirrelator - Squirrelator is more powerful than all the birds in the woods. He will steal your nuts!